Sheriff Joe says none of the 1033 crap worked anyway. If you watched the congressional hearings on “police militarization,” you probably already know that the chances of any major changes post-Ferguson are best described as slim to none. At a recent closed door meeting of law enforcement leaders hosted by the Police Executive Research Forum, many chiefs like Philadelphia’s Charles Ramsey and St. Louis County Police Dept. Colonel Jon Belmar worried that public misperception might make it difficult going forward for agencies to acquire mine-resistant vehicles and RPGs because of the public’s misperceptions. That seems highly unlikely. Even if they roll back the 1033 program started under President Clinton there’s the larger and more significant issue of what agencies are buying with their end of the DHS bloc grants. But there are a small number of agencies that look like they will be made examples of by federal officials looking for anyway to ameliorate civilian concerns about the acquisition of military equipment at no cost by local law enforcement agencies. Here’s the thing – agencies don’t need to say what they have or plan to use the gear for. There is no training, oversight and almost nothing in the way of reporting requirements for the agencies that have received the stuff. But you do need to keep track of the gear or this could happen. In Texas, the Eustace Police Department has been suspended from the Department of Defense’s 1033 program that provides military surplus to law enforcement agencies. According to records obtained by local news station KLTV 7 Investigates, the Eustace Police Department received $707,000 worth of equipment from the program. Those items ranged from a truck tractor worth $166,233 to M-16 rifles and various other items. It’s unclear if that gear can currently be accounted for. In addition, Maricopa County Sheriff Joe Arpaio is preparing to send back hundreds of weapons received under the 1033 program. Arpaio says the MCSO lost or misplaced several items the agency received. To date more than 100 agencies are “suspended” from the program for similar reasons despite the fact that Sheriff Joe says he’s the only one that has been targeted by the feds. 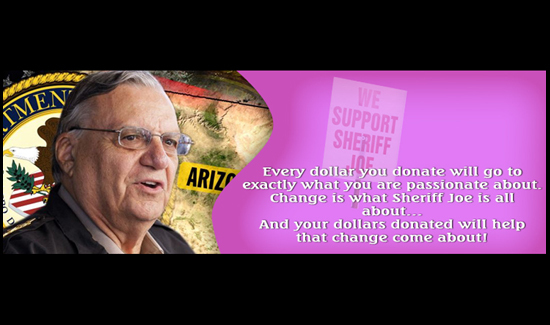 So how will Sheriff Joe get buy without all that critical equipment? “It really doesn’t mean anything. Look at the handguns. They probably don’t work anyway. We have plenty of our own,” Arpaio told reporters. “We’d like to find them (missing weapons). We don’t know where they’re at. We keep auditing to try to find them, but way back then we didn’t have the high tech computer system [to track them],” Arpaio explained.